I have always treasured the above experience, and the memory of it gave me support and encouragement in my earlier glass endeavors. Actually, it still does. I think the completed work in question did partake of the magic potential of stained glass, a unique art form in which the primary and indispensible medium is light itself. Here are some pictures of the window; you can click on the detail thumbnails to enlarge them. 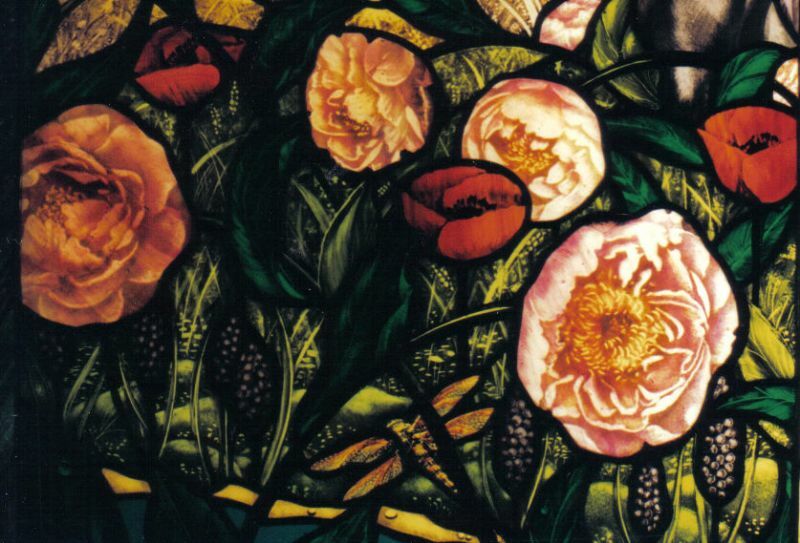 It illustrates the essence of my own glass aesthetic, which might be described as Renaissance or Pre-Raphaelite realism combined with and deftly coaxed from minimally painted beautiful glass. 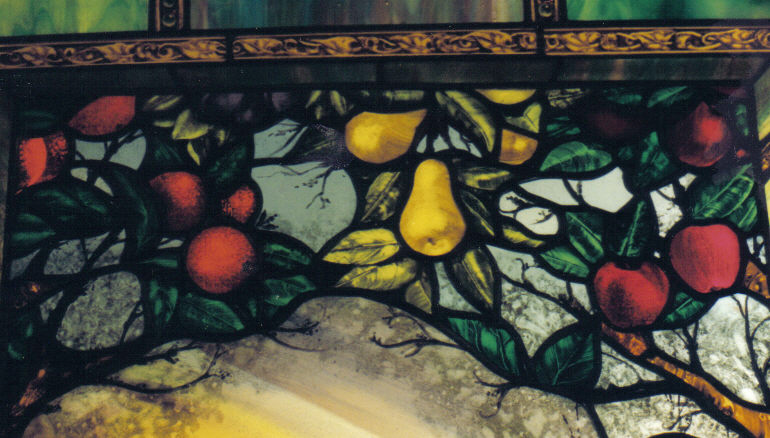 I think this window and the three that follow which contain faces I painted after Leonardo and Michelangelo (who have taught me more than anyone I have actually spoken to), are my favorite early glass pieces. The three master copies are actually window hangings, which I love because they can be relocated, and because by nature they are paintings which change constantly with light and season, and therefore never seem to become invisible as paintings on the wall can be predisposed to do. 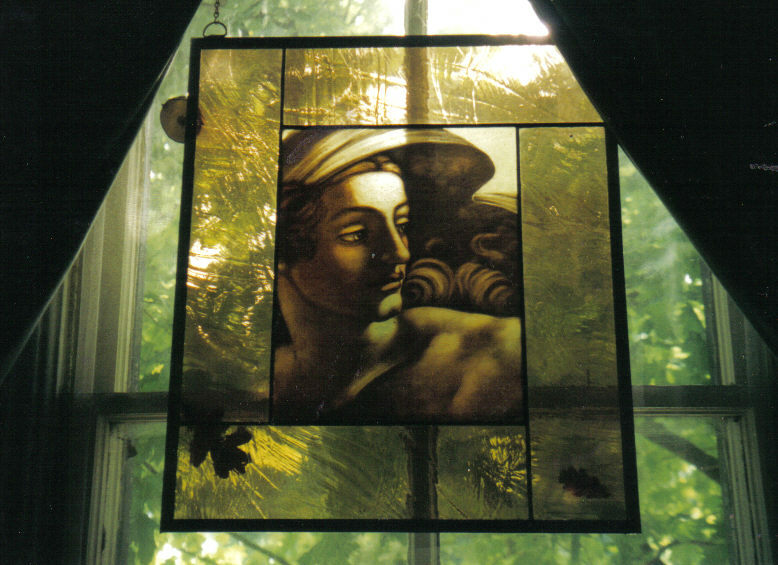 The Michelangelo hung for a long time in my house in Iowa in a window framing a maple tree, and faced east. Its background was alternately green, yellow, neutral, and snowy white with the changes of season, and it glittered stunningly in the early morning. 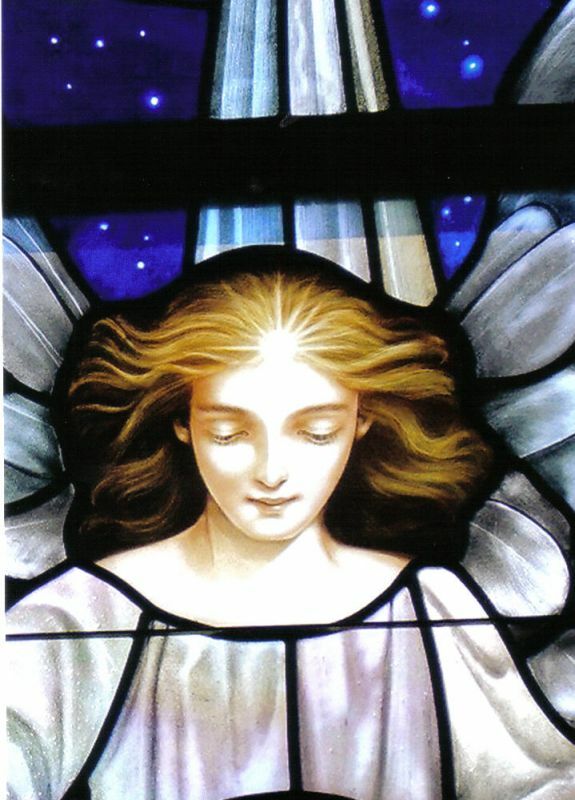 I now work as head artist for a traditional stained glass studio, designing and painting new windows for churches and other venues in essentially the same way as did the artists of the Gothic cathedrals. 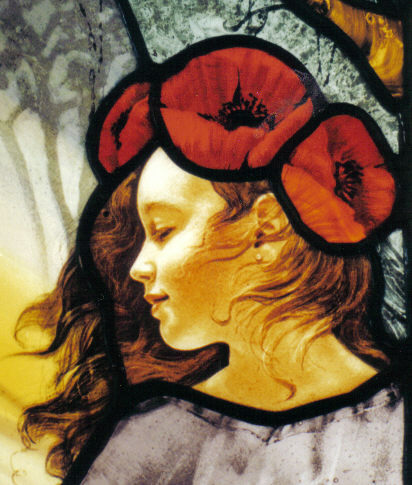 Before I fill the pages which follow with pictures of the windows I love and detail shots of my favorite faces, I would like to conclude this introduction with a little background on stained glass making. Everyone, even those of us not of religious persuasion, has seen stained glass, and yet the process involved is mysterious to most people, as evidenced by the fact that I have been asked the questions “Do you paint the glass and then cut it, or do you cut it first?” “What are the black lines?” “How do you make the faces? Are they really painted?” When I was first introduced to working with glass I had certainly never thought about it for a second either, as much as these questions may make my eyes pop now. The main event, of course, is the glass itself. 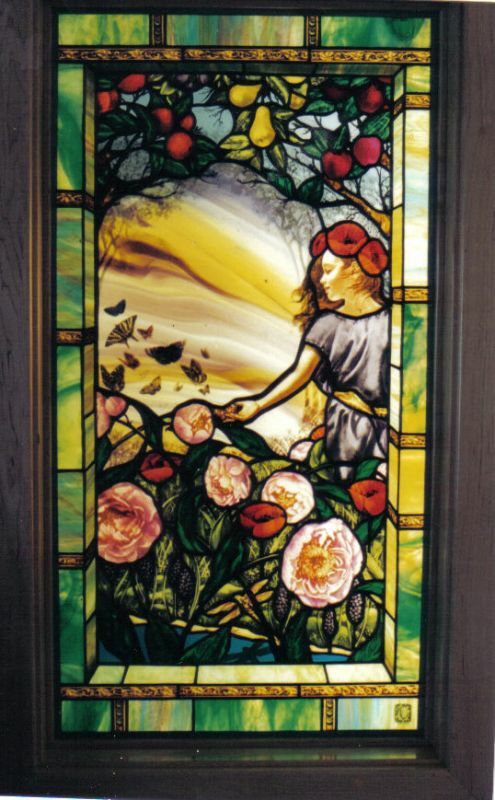 The colors are not painted but are inherent in the glass. (And what colors! Talk about magic!) The glass comes in sheets, and is cut into shapes. The most brilliant and beautiful glass, and that which I use almost exclusively now, is actually mouth-blown. 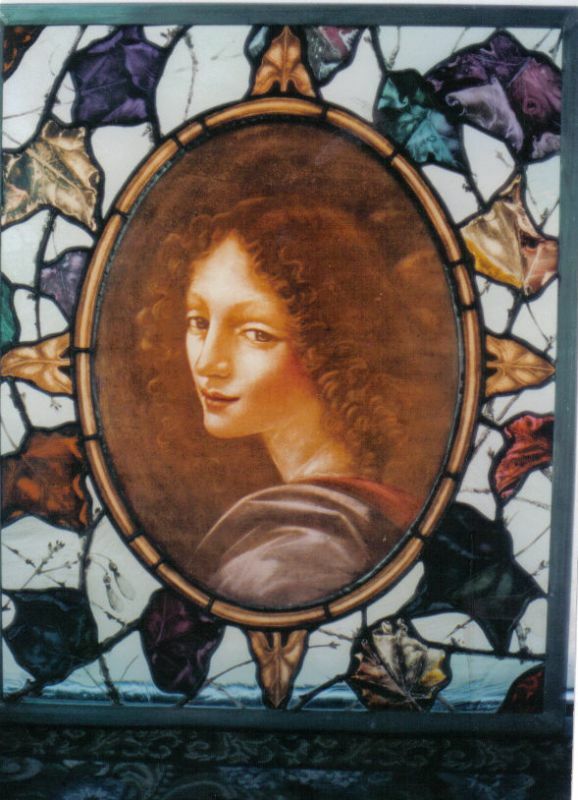 When realism or other effect is desired, the glass pieces are painted, and then fired in a kiln. I usually begin with clear glass for a realistic face, and often paint and fire it several times, building richness of light and shadow with each layer. The paint used contains mineral elements and powdered glass; the original glass melts slightly in the kiln, the paint melts, and the resulting painted piece contains the paint rather than supports it, so that an individual face held in the hand does appear a kind of miraculous. For garments and other background, I use colored glass, creating shadows with dark layers of paint, or simply leaving the jewel-like glass with its bubbles and striations to sparkle on its own. The finished pieces, varying in size from about a square inch to a square foot, for each panel are assembled like a puzzle using lead strips (hence the term “leaded glass”), and soldered where the strips join. There is then a cementing and barring process for structural stability, and the panels are ready to be trucked to their ultimate destination and installed in pre-existing frames. Most individual panels are not larger than about twelve square feet; a monumental window will be constructed of many panels this size. My part (the design, the full-sized drawing, and the painting of the glass) in what is obviously a many-faceted process and one often requiring considerable physical strength, is crucial to the point that I feel justified in referring to the studio windows as “my” windows, and yet the windows couldn’t exist without my co-workers, and I seldom even see the larger ones in their entirety. The picture at the beginning of this page is a detail from the Nativity window in St.Mark’s Anglican church in Vero Beach Florida, a Conrad Pickel project consisting of twenty two windows, “my” windows, which I can enjoy as often as I want since for once I live in the same town. In future pages I will include a lot more pictures. However in the meantime please visit the website of Conrad Pickel Studio and open the stained or leaded glass galleries, or click on my name and open that gallery. I will see you there.